Presenting the first (and not necessarily last) TLA Best of Bahrain Awards! TLA is off to new horizons, to lands unknown, but not without first imparting a little of my less than expert institutional knowledge gained spending over 22 months on this rock on the Western edges Persian Gulf. Best Friday Brunch: Meh… If I’m really honest about it, I didn’t much care for Friday brunches. It was overpriced, over-boozed, and overrated. You end up spending half the day eating and drinking, and then you end up unable to do anything with the rest of your day and to kick you’re able to enjoy a headache that lasts well into the next morning. I can think of better ways to spend my Fridays. Best Beach: Al Dar Island is an under appreciated spot with great views (albeit mostly of oil refineries) and good times. It’s nice to grab a beer and food and lounge on a beach cabana. We wanted to rent one of the overnight cabins with some friends but never got around to it. Honorable Mention: There is a little public beach down on the south western coast called Al Jaza’ir that was a lot better than friends described, and my wife and I sat on a piece of cardboard (it’s more ground up seashells than sand) and ate cheese, salami, and crackers one afternoon. 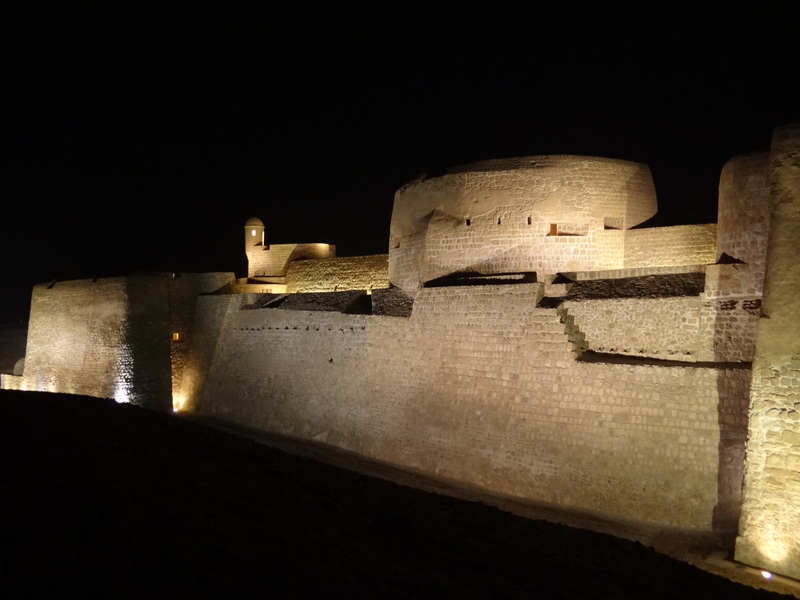 Best Tourist Attraction: Qa’lat Al-Bahrain (Bahrain Fort) is by far the most spectacular historical monument in Bahrain. It is a UNESCO World Heritage Site and home to five forts on the seafront and ruins of civilizations that date to times B.C. However, the most striking remnant of the past is the Portuguese-constructed fort whose minaret-shaped turret is hard to forget. It is also a great place to people watch, as Bahrainis of all stripes converge there each evening (especially in the fall and spring) to enjoy the walking paths, ride their horses, and dip their feet in the waters of Persian Gulf. Honorable Mention: Another newly-christened UNESCO WHS, the Pearling Pathway, traces its path through the northern island of Muharraq. It is difficult to find and hard to follow, but for the adventurous traveler, it is worth the time and energy. Most underrated tourist attraction: The Manama Suq is a fun spot to frequent if you live in Bahrain, but if you wind through the suq, passing all the gold and trinket shops, as well as the tailor shops and remittance brokers, you will finally reach the intersection where a number of the most important Shi’a religious centers face each other in a perpetual stand off, unwilling to give any more sacred ground to the others. It is the site of the most fervent of the bloody Ashura processions each year, and the crossroads of an uprising. Make sure a protest is not planned for your visit. Most overrated tourist attraction: I really wanted to love the Bahrain Formula 1 Grand Prix. I do not regret attending the event last year, but it was overpriced, under-attended, and an attempt to persuade the world that everything is just fine — while that couldn’t be much further from the truth. And on top of all that, it costs a fortune and really hurts the eardrums. At half the price, in a less divided society, and with a good set of ear plugs, this could be an attraction I’d recommend. Water Parks and Amusement Parks: Stick to Disney. Best overall restaurant: Masso at the Palace Hotel was the best recommendation I received during my tenure as a Political Officer in Bahrain. Although I can’t verify the veracity of the story, I’ve heard the private chef of an Emirati Sheikh ditched her gig and was offered the opportunity to create her menu at the newly renovated Masso. Whatever the story, the ambiance reminds one of a medieval abbey, while the food is anything but humble. Honorable Mention: Honey Thai is tucked in an old building in the corner of the suq and features terrible service, with a shabby interior, but the best Thai food on the island. Warning: There is no such thing as medium spicy. Best of the rest: Bahrain has easily the best food in the Persian Gulf. I know what you’re thinking: that’s not saying much, but really, Bahrain is an excellent place to enjoy a pretty good variety of food. If you want great Indian food you can head down to Qudaibiya and enjoy some real Indian food, veggie or meat-filled. Don’t waste your time with the more expensive spots in town, the food is no better and the patrons wear too much deodorant. For good sushi don’t go cheap. Instead, hit up the high-priced Buddha Bar sister restaurant Bushido. It’s over the top and worth the extra dinars every once in a while. Good pizza is hard to find, and frankly I usually preferred giving The Hunger Line a call for a delivery Papa John’s pizza (and there is even a Pizza Hut and Dominoes for those with less refined palettes). If a burger is what you are craving, nothing beats Elevation Burger at Seef Mall, although Blaze burger is a good second best if don’t want to fight the mall traffic. Chinese food isn’t really that great, so pick whatever restaurant you want and expect mediocrity. Mexican food is half-decent, and you might as well go to Senor Pacos, so that you can enjoy the Filipino singer cover Hotel California in Spanish. Speaking of Filipino food, Bahay Kubo is a great option, if you have the patience to deal with bad service. Go with a big group and get the karaoke room, but you’ll have to find the confidence sans alcohol. There are a lot of choices for English food, but I’d prefer to just go to the Rugby Club with my mates and grab a grilled steak on Wednesday nights (assuming I know someone who is a member). I never discovered a great Lebanese restaurant (disappointment) in Bahrain, although I am sure there was one, but it was nice to have a few decent Persian restaurants. Go to Parsian for a delicious meal and a decorum that’s overdone, but representative. You could also try some fast food from one of the Isfahani restaurants that dot the island. If you want a decent shwarma there are stands all over the country, but my favorite was Al-Shorfa, near the Molotov battlefield of Janussan. But, for the best of the best of the rest look no further than the Turkish delight of Iskanderoon Grills. Our motorpool dispatcher recommended the place to me when I first arrived and I have been enjoying their delicious breads, yogurt and hearty meat dishes ever since. It is a can’t miss restaurant. Best place to grab a beer: It’s got to be Jim’s Beer Garden in Adliya, the walking nightlife district where every expat finds themselves spending a significant amount of time. Best people-watching opportunities: CoCo’s, also in Adliya, serves no alcohol, but has easily the most charming atmosphere in Bahrain. It’s two-story restaurant is located in an old home and has no sign outside to designate it isn’t a private residence. The food is great and since they don’t serve alcohol, you can see equal parts Bahrainis and expats at the tables sipping frothy peach iced teas. Best cheesy over-the-top themed joint: Trader Vic’s takes the cocktail on this one. The famous/infamous Prime Minister owns this place and the Polynesian theme transports the patrons to some place near Tahiti. The beef cho cho and duck tacos make for fun eating experiences. Downside: the bethobed Saudis that chain smoke and stare at the waitresses who don skirt with slits up to their hips. Best to avoid: Any two-star hotel restaurant or sketchy massage parlors, where the services likely include more than you bargained for, according to local lore. Best mall: I don’t really have a strong preference, but my wife has told me that City Centre has the best shopping on the island. One tip, avoid the malls on Wednesday and the Thursday nights if you don’t like insane traffic. Mall shopping is the national pastime for most Gulf countries and Bahrain is no exception. 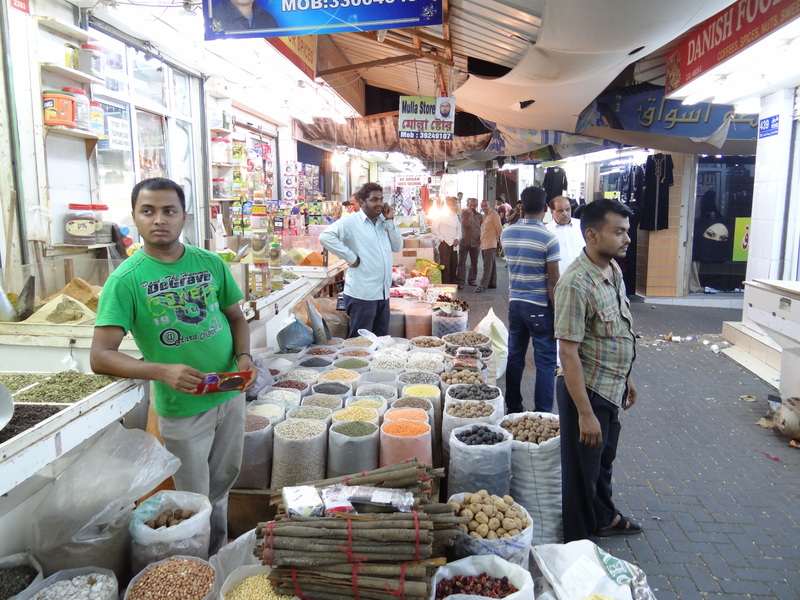 Best local experience: Manama Suq offers the flavor of a Middle Eastern shopping experience, although most shopkeepers are South Asian. The suq (Arabic for market) is setup with a few different zones that include spices, gold, cheap toys, tailors, and random other shops interspersed throughout. Opposition activists have taken to calling for protests there lately, so pay attention to our demonstration notices before you start searching for a knock-off Rolex. Best tailor: After a very long search and many questions asked of locals, I found Ghulam Morteza’s tailor shop and ordered a number of great suits. He used to make suits for the former Emir, but perhaps his reputation has taken away any sense of urgency, because it is not unheard of for him to take more than two months to deliver on an order. My favorite tailor has to be Shabbir Sharafali, whose shop is just his last name. He weaves a good story and will go out of his way to make sure you are satisfied. I got a three piece black Mo hair (had no idea what this was a month ago) suit with a match pocket as my last hurrah, and I was not disappointed. Best grocery store: After shopping at a number of places, I finally settled on Al Jazira in Zinj as my favorite spot to get groceries. It was quick, small, and yet stocked with nearly everything you could want. It had the sin room (for pork lovers) and allowed you to avoid navigating a mall to get groceries at one of the mega stores like the French brands Geant and Carrefour. A fun alternative is LuLu Hypermarket whose target market is South Asians and offers an insane produce selection. At least a third of the fruits and vegetables available I had never seen in my life. Best nursery: My hobby is gardening and Bahrain has a number of great nurseries to keep your garden stocked with great plants. All along Budaiya Highway there are a number of great nurseries. When I left Bahrain I gave away all my plants, but were the most popular parting gifts (well, that is other than our alcohol). 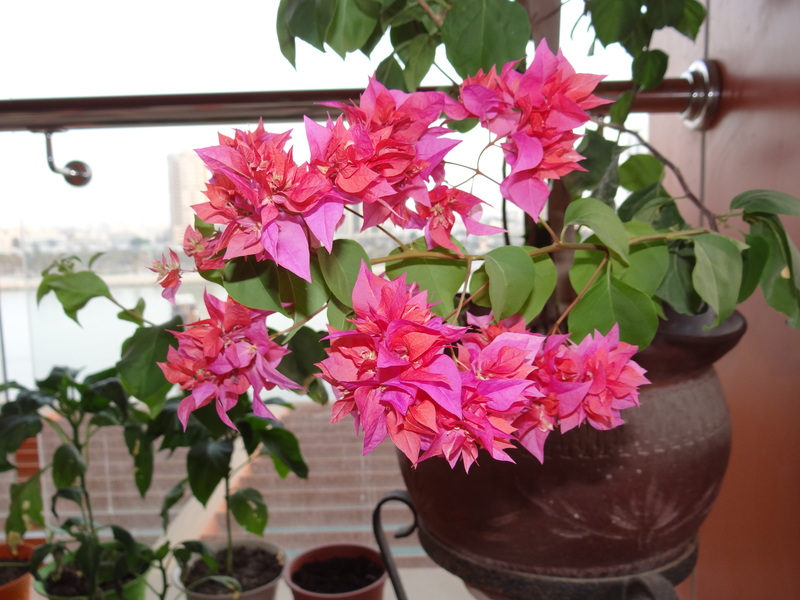 Plants from a Bahraini nursery. Best Persian carpets: Bradran has the best carpets, hands down. Many people who pass through the Middle East hope to scoop up a beautiful carpet at a fair price. What they usually end up with is a sub-par carpet at a steep price purchased from some sleezy guy that probably has never been to Iran. Bradran is owned by the prominent Kazerooni family, who traces its roots to the village of Kazeroon in Iran, and whose transnational links provide it with an intimate knowledge of rug origins and artists. They are fair in their prices and willing to bargain. They also provide the best cleaning services. Avoid carpet alley — it is there for the tourists and thus, there to cheat the tourists. Best road trip: The Bahrain-Doha Connection (also the worst road trip). Best regional getaway: With the onset of the Arab Spring, travel opportunities have diminished for those who value their safety. Jordan is close, full of biblical, Roman, and pre-historic history, and still relatively safe. Best flight: The one home to the States on Lufthansa. Our cat survived the winter journey and apparently spent time at the animal lounge, according to the Lufthansa attendant, probably sipping a cocktail and enjoying the long-haired female kitties from abroad. Excellent recap of this tiny island we all shared space and time in! Your, Mrs. K’s and the Two Crabs absence are monumentally obvious! Another place..another time…I hope!